Touring the engineering workshop of Auckland-based Metal Skills as part of national Got a Trade Week has proved a good way for jobseekers from One Tree Hill College and their Technology Teacher Jeff Harnish to learn about a career in engineering and gain tips for getting started. These students join other students, teachers and jobseekers who are taking part in one of 26 Competenz Discovery Tours across the country. These tours are an opportunity to visit a local workplace to learn about the career options available in trades and services industries and the work involved. Got a Trade Week is also a chance to hear from current trades apprentices who are enjoying the benefits of training on-the-job in their chosen trade. Competenz customer Metal Skills joins 25 other companies which have generously opened their doors to host a Competenz Discovery Tour. 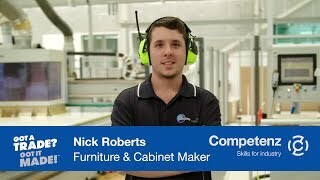 Got a Trade Week is a national campaign, chaired by Competenz and supported by seven industry training organisations, that promotes and celebrates careers in New Zealand’s trades and service industries and the benefits of learning on-the-job. Meet one of our Competenz heroes in the engineering industry - click here. Photo: Students from One Tree Hill College tour the Metal Skills factory. Left to right: Phillip Ward (Operations Manager), Jeff Harnish (Technology teacher), Gerard Robbins (Competenz account manager), year 12 students Charden, Damian and Xavier.